I'm trying something new... I realized last week with the kids being on "Winter Break" and the temperatures here in Michigan being well below freeeeeezzzzing that it was this time last year we planned a last minute "road trip" down to Florida to get away from what seemed like an even more terrible winter!! Perhaps even more shocking was that I realized I had never even preserved that memory on this old blog!!! That, and many others!!! So, I'm going to try to do some catching up with some "Throwback Thursday" posts!!! We didn't want to drive too far south, so we aimed for the Orlando area. However, the immediate Orlando area was quite booked as most people make plans way in advance if going to Orlando or Disney. So, we settled on a nice house we found in Davenport, Florida which was just close enough to plenty of things, including all of the attractions in the Orlando area. I believe we stayed in this golf community called Providence and it was very nice. We were lucky to find it last minute and at a decent price. 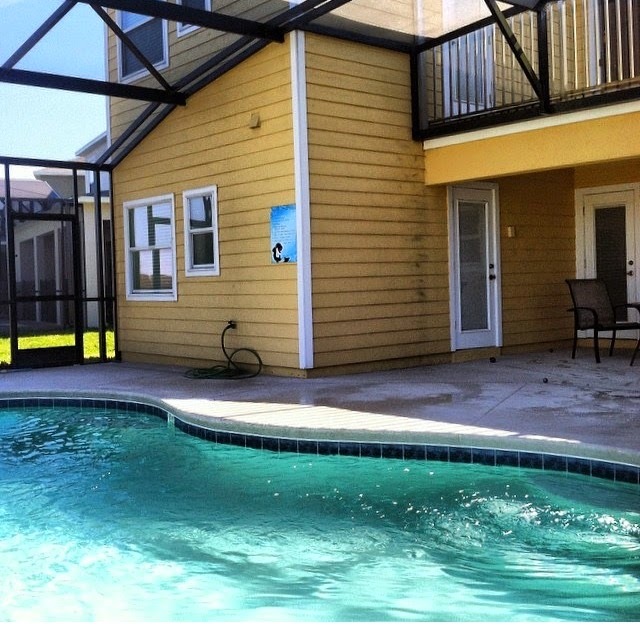 Experience has shown us that with our family of five, particularly grown teenagers, it is much better to rent a condo or house with a pool. If you shop around, you can often get a better price per night than many hotels and we feel we save some money by eating breakfast and a few meals at home. We left very early in the morning and spent our first night in Georgia and then drove through the next morning. We had just missed, by 24 hours, a huge rare winter storm that went all the way down to Georgia. We saw the aftermath of trees down and stranded cars on our way down I-75 South. We were lucky that, for the most part, our trip was smooth sailing. Finally crossing into the Florida state line and stopping at the first Florida rest area is always exciting... That's right - we're tourists!!! I can never resist a shot of the palm trees -- even if they are at a rest area. After leaving the huge amounts of snow, I don't know if they've ever looked as good as they did on this trip. Once we reached our house we were pretty happy with it!! Although it was not the nicest house we ever stayed at, it was still very nice and especially considering our last minute planning. Last year, this is how I spent President's Day...poolside!! We are "Disney people" and although this was not designed to be that kind of trip, we could not resist taking advantage of some of the Disney experiences. 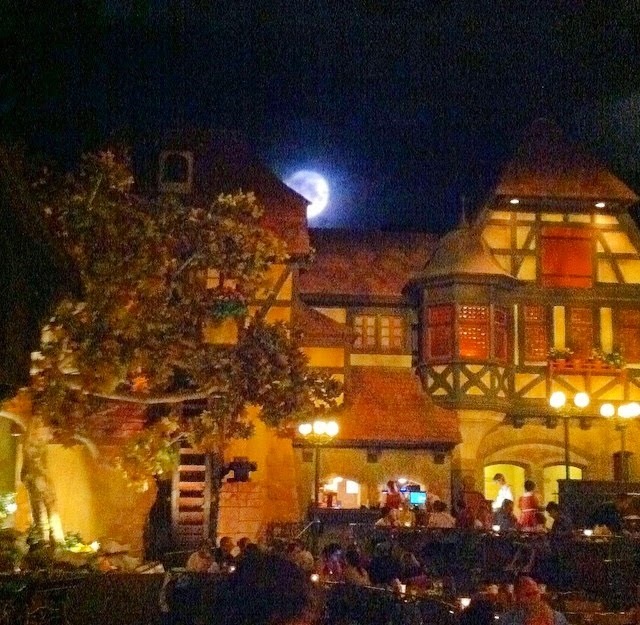 One night, we made a dinner reservation at the Polynesian Resort followed by some relaxing and fireworks outside. It was very nice and the extra tropical atmosphere was more than welcome!! While the girls and I hung out by the pool several days, the boys took advantage of the golf course that was within the community where we stayed. But I don't know if I would have been as relaxed by the pool if I knew this guy was watching their golf game -- yikes!!!! After a couple more days, we had to get our Disney side on... We would only be spending one day at a Disney park and decided that Epcot was our park of choice! I feel it has a good mix of rides, shopping, cultures, restaurants and shows and although we like all of the parks, everyone was happy with Epcot!! Entering the Disney gates never gets old!! I hate to admit this, but one of our favorite stops is always "Club Cool" with its free samples of Coca Cola flavors from around the world. The kids have loved taste testing, mixing, and quenching their thirst from the hot Florida sunshine at this place since they were little kids (and we like it, too)!!! Have you done this before? I feel like some people don't know about it and if they did it would be much more crowded. Being out and about and kids at least pretending to get along is a good thing!! It was nice to not have any particularly strict agenda since we have seen most everything before. At one point, we were even able to let the kids do some exploring on their own!! That part was new and exciting! We did most of the big attractions, Spaceship Earth, Soarin', Test Track, Ellen's Energy Adventure, The Seas, Also the Maelstrom in Norway -- which I understand is closed now in order to make way for a much bigger "Frozen" attraction that has taken the world by "storm" for the past year or more. Of course, we also realized we had to a meet and greet with at least one of the Disney character -- so we chose our main mouse, Mickey. A rare family picture (complete with my lovely hair sticking out because I just took it down for the pic...nice!). Another evening was spent at Cape Canaveral where we witnessed our first ever live rocket launch which you can read about here. We viewed from a local park where several others also gathered to witness the launch. There were several delays in the liftoff time which we monitored by their website on our phones. It was a bit frustrating and there was a moment where we thought they were going to have to postpone the launch, but then we finally saw it and it was well worth the wait. Very cool!! We returned to a driveway full of snow and thick ice along with several more weeks of the longest Winter ever!!! So thankful we were able to get a break with a last minute vacation to The Sunshine State which never seems to disappoint this family!!!!! As a quick follow up and update to last week's post, I am happy to say that the Oscar for Best Actress went to Julianne Moore for the movie "Still Alice". I am happy that I can actually name a few things that have recently raised public awareness to Alzheimer's Disease. One is the movie "Still Alice" and all of the buzz it brought on the talk show circuit when Julianne Moore, Kristen Stewart and others did a press junket, two is the Oscar win, anther is Glen Campbell's recent Grammy win of the song he wrote before his Alzheimer's got worse which is "I'm Not Going to Miss You". That song was nominated for an Oscar last night and performed by Tim McGraw since Glen Campbell is at a stage in the illness where he can no longer perform. By the way, major tear jerker of a song, at least for me!! I hope these videos from YouTube work. One is performed by Glen Campbell and the other Tim McGraw. I like them both...Glen Campbell because he wrote it and is singing this while struggling with the disease, Tim McGraw because...he's incredibly HOT!!!! One more recent thing was that Leeza Gibbons recently won Celebrity Apprentice where she earned a total of $390,000 for her charity Leeza's Care Connection which she started in honor of her mother. Hopefully, once Still Alice is released on DVD in the Spring there will be yet more awareness and discussion. You have to understand that Alzheimer's is a very isolating disease that many don't want to talk about and for the most part the person struggling with the disease is literally unable to advocate for themselves. So, I am pleased that some people who are able to bring public awareness are doing so. Moving on, those of you who follow me on Instagram may be aware that my kids were on Winter Break from school last week. I took the three of them out to lunch at Panera one day and then we all headed over to visit with my mom. She was seated near the nurse's station which is just off the elevator. As there is no real place for five of us to visit without being in the way, the kids took Grandma down to the seating area near her room. Grandma was pretty quiet, but seemed glad to see the kids. Generally, I don't think it's the best idea for the whole family to visit at once as I think it's a bit overwhelming for her. My mom was again pretty subdued. I have not seen as much of her sense of humor in the last few visits as I would like. Sadly, much like our Christmas visit, she was unable to recall any of my kids names, although when pressed she did think Kristin was Megan. Close, but it does break my heart and you can see that the kids are not shocked, but a bit disappointed. I am not completely convinced my mom still might have a day when she knows, but for the most part it saddens me to realize that even when prompted she was not able to come up with "Kristin Mary". Kristin has her grandma's middle name and up until a couple of years ago my mom would tell anyone who would listen that her granddaughter was "Kristin Mary". In fact, all of my kids have a part of my mom's name in their name. So far, she always knows who I am. Not long after we arrived, the kids went to look for the resident cats. They found out they are no longer there. As of now, I am not sure what that means, whether they were moved to another floor or moved out of the building!? Funny enough, in their search for the cats they came back to report there was a dog!! Soon after, that cute Golden Retriever was heading our way and came to visit us and Grandma. We learned his name was "Gunner" and he was very friendly. I gave him lots of loving and so did the kids. We have a Goldendoodle dog named Lucky, so we love dogs!! My mom apparently has met Gunner several times before. I asked her if she wanted to pet him and she said "when he settles down". Ha! Good luck with that! With me and my three kids around we weren't exactly good for settling him down. He wasn't jumping or anything, just happy to see us!! My mom was also not thrilled when Gunner's wet nose rubbed against her hand!! Clearly, grandma was not as interested in Gunner as we were. I got my mom "Muffin" from her room, and she was happy with that. I noticed Gunner's owner was talking to the family of the new resident across from my mom's room. I couldn't help but overhear them say that she had moved from the second floor to the third. That is what my mom did. We also talked to the activities director, Linda, and she told us they were going to be doing some trivia for President's Day. She and several others also thanked me for the Valentine's gifts I left for them the week before. In the picture below, Grandma was trying to get Jacob to let her give him a kiss on the cheek!!! I think because there were too many people around, Jacob played hard to get and was teasing his Grandma! He knows that once Grandma "gets him" she might not let go! I also managed a quick picture with the girls before we left. I was glad to see an activity would soon be starting, and I noticed that the floor seems pretty active again with residents. As a side note, I follow the Alzheimer's Association on Facebook and this past week they asked that people post a picture of their loved one to be posted in their "gallery" in honor of the Oscars and the movie "Still Alice" and using the hashtags "MyBrain" "Still_____", etc. Well, since I had just seen the movie and posted about it last week, I figured it was meant to be so I took part in that one. The picture below is a glimpse of the gallery of pictures that has formed with hundreds or thousands of pictures. I do love that part of social media that connects people like that. This week I will pay another visit to my mom and hope for warmer temperatures and days ahead where we can go back outside like we did on this lovely Fall day!!! With regular temps at -15 F here in Michigan, I am hanging out at home on Sunday and taking the time to prepare this post ahead of time -- I refuse to go out in this freezing weather if I don't absolutely have to!! 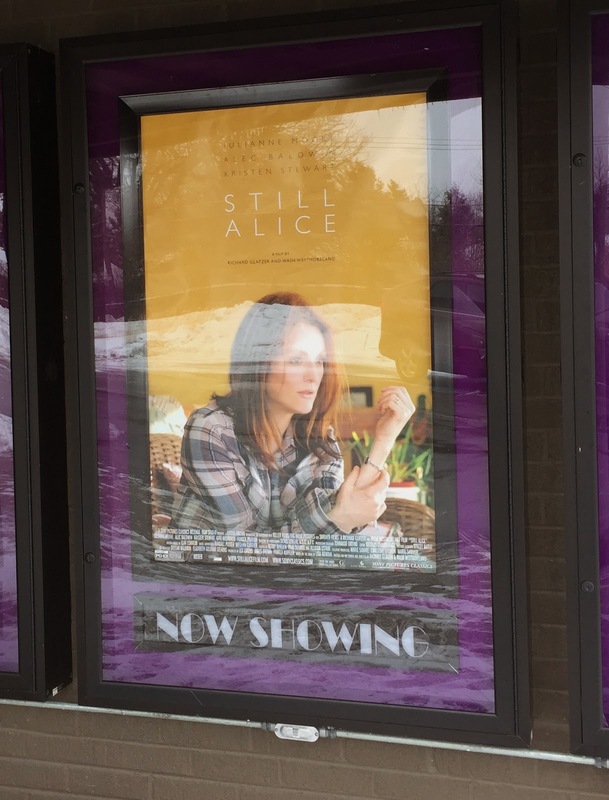 I mentioned in my post last week I would talk about "Still Alice" this week. The Oscars are this Sunday, February 22nd. I read the book "Still Alice" by Lisa Genova while I was vacationing in sunny Arizona four years ago, and it was a quick read and a good book. I was excited to learn they were making the book into a movie and that Julianne Moore would be playing the part of Alice. Even more exciting, Julianne Moore has been nominated "Best Actress" for her role in the movie. The prospect of this movie bringing awareness to everyone's local theatre was kind of exciting to me as I thought this was a good way for the general public to get a glimpse of the experience. To "know" someone struggling with this disease is not enough... I say live with the person for a week, shadowing them 24/7, alone, and then you will "know". I noticed Julianne Moore was making the rounds on the talk show circuit for the last couple of months. I Googled and tracked the "release dates" for the movie the last couple of months. There were several release dates, some in December which is when she won the Critic's Choice Award for Best Actress. I noticed January 16th and February 6th were also listed as release dates. I soon learned that the January release dates were small releases in "select cities" such as New York and L.A. Then I learned that "nationwide" release was February 6th. By February 6th, I was more than ready to go see the movie, but could not locate it any of my large and local theatres. Ugh! Finally, with more Googling I found two theatres in the State of Michigan showing the movie. One was about 30 minutes away and was showing the movie for only a week, the other was about two hours away. This theatre is known for showing more "artsy" type movies. To be honest, I was sooooo disappointed to realize that after finally getting this movie made, and even with big names (Alec Baldwin and Kristen Stewart also play supporting roles) it was not more widely released. I went to the first show on a Monday morning. At first I thought there would be about ten people, but I was glad to see the theatre gradually fill almost to capacity. I thought the movie was quite good, and I noticed not one person got up during the movie. I don't know if it was the type of audience, or that we all didn't want to miss anything. I found it ironic that the struggles and research I had to do just to find this movie -- well it sure was reminiscent of the struggles caregivers and those affected with Alzheimer's Disease go through on a daily basis. What should be or seems like a simple thing can become complicated. It's too bad the movie was not picked up by more theatres, but I expect an April 2015 DVD release date and I hope some of you will put it on your list of movies to see. Okay, now I'll get off my "Still Alice" bandwagon and go back to "Still Mom". When I visited, there they were again -- watching a soap opera. My mom and the same "friend" from last week. Quietly sitting. My mom was giving me some "dirty looks" and I quickly noticed she was a bit crabby. I asked her if she was feeling okay and she said she was. She also seemed a bit tired, but managed to stay awake. While I was there, a young volunteer was going around saying "hello" to the residents and she gave my mom this Valentine card. I took her to a nearby table and asked if I could do her nails. She questioned me on if I "knew how" and would do "a good job". I assured her I did and would!! I've been trimming her nails every few weeks, as I've noticed this is not a level of care that is "included" in her living there. I believe there is someone from the beauty salon you can pay to come around and give manicures. So far, I'm fine with just occasionally doing it myself, but I may try that service at some point. You may recall, Kristin used to paint her Grandma's nails quite a bit when she was in her assisted living community. Then, after awhile, my mom said she didn't want nail polish on them anymore. So, we let it go for a bit. However, I felt a nice neutral pinkish color would be a nice Valentine's Day treat from me! I did have to remind her to let her hands dry before she fussed with her clothes or got "Muffin" back. I was happy with how they turned out! I noticed a new resident seems to have moved into the room across the hall from my mom. I said hello to the family caregiver who seemed to be there helping to get the resident situated. I know these beds are in demand and don't expect any of them to be empty for more than a couple of days. Some residents moving from other floors as my mom did, or just moving in for the first time. My mom remained quiet and her friend came over and tried to say something to me, but the words don't really come out or make sense so I just smile and say "you look nice today". My mom was also saying some things that I couldn't make too much sense of. At one point, she took my hand and squeezed it really hard and said something about something....and that I "hurt her feelings". Sadly, I have no idea what she was talking about so I just said I was sorry and that I didn't mean to hurt her feelings. She still seemed a bit mad. It bothered me, but I was able to brush it off. There was a time when something like that would have really bothered me. Now, it mainly just bothers me because I realize she is having a bad day and want to make sure she isn't in any kind of pain or having any issues. If she's the same on the next visit, I will be talking to the staff about it. For now, I will assume she was having a bad day, tired, and so I eventually left her to rest with Muffin. Speaking of the staff, I brought some gifts over to "spread some love" from me and my mom for Valentine's Day. I also left a few things for the girls on the second shift whom I don't see as often. Just a little something to let them know how much I appreciate what they do!! My brother is down in sunny Key West, Florida with his son on vacation, so I will try to visit my mom a bit more this week if I can! I have to admit, after being sick for three weeks as I was, I'm a little shy about "over" visiting my mom's health care community during this flu season. I use the hand sanitizer they provide like crazy!!! I'm sure we will all feel better when we see some signs of Spring -- hopefully before we know it!!!! I had every intention of posting on Monday, but what can I say? Time got away from me, and you don't mind if it's actually Wednesday, do you?? Last Friday I made another visit to see my mom. It seemed fairly quiet on her floor and I soon noticed my mom was watching TV with another resident. I kind of snuck behind her and went into her room first so I could check on a few things and hang "my heart" on her door. I don't know why, but I feel the need to always have her seasonally decorated. You may recall at her assisted living community she had a "shelf" outside her door for me to decorate. Now, I pretty much just have the door and when she moved in her roommate had nothing on it even though there is a hook on the door. So, I have taken it upon myself to do so. I am actually looking for just one pretty wreath that is not seasonal that I could leave there. So far, I haven't found what I'm looking for. The things I have seen usually look very "spring" or "fall" or holiday. Why are you coming out of my room? She did not realize I had snuck in behind her and was surprised to see me coming out of her room!! I thought it was nice to see just my mom and her friend sitting and watching TV. I think her friend's name is either Bonnie or they call her "Bunny", but I could be wrong. I'm so terrible with names! I can't ask my mom for the names, and I seem to only learn them when I hear the staff using their names. I thought it was cute that they were watching "The Middle" (one of my favorite shows)!! I pulled up a chair next to my mom and caught up on a couple of old episodes that I had never seen. It was nice to see my mom seem to understand a lot of the humor in the show and she was quite interested. Many time during the show I would say "that is my life" and she would chuckle. At one point, when I tried to take her picture she moved her head so she could still see the show!! I guess my camera was blocking her, but it made me laugh to see she was that engrossed in the show. I do wish my mom had a "go to" "bestie" type friend in her nursing community. Someone that she was excited to see or whose name she knows. From what I can tell, that is not the case. Perhaps this day was the beginning of a new friendship!? I will be on the lookout for that. It is so hard for them to connect with one another when both are experiencing memory issues. It does not help that my mom is no longer walking so even if she wanted to start a conversation with someone, she is not mobile enough to make it happen unless they are already right there with her. Best Friends -- At Least for Today! It was right around this point in my visit that I remembered that one of the residents, "Patricia", did not seem to be doing well when I was there a few days earlier. I mentioned this in my last post. Her room is directly across the hall from my mom's. I hesitantly looked over and saw her name was removed from the plaque by the door. I peeked in and she was not there. My heart sank. I am quite sure she has passed away, but I did not have the heart to ask the staff. They seemed to be having a nice little Friday chat session (which I don't often see them do)...and in my heart I knew the answer and there was no point risking getting the staff upset. The rest of my visit, I couldn't stop thinking about it. She was the sweet old lady who was so nice to my when she got back from her week in the hospital in November. Although she looked much older than my mom, she still did very well in trivia! I don't know if it's my imagination, but the halls are seeming emptier to me. I don't have the heart to walk around and see how many names might be missing from the doorways... As it is, there are only about 20 residents on my mom's memory care floor. So, if 20 becomes 15 or 10, you notice. I am also seeing some new faces. But the halls seem quieter, and the winter always seems longer. I am again reminded how fragile life is. I feel I am always walking the fine line between making sure I'm living mine (as my mom would want) and helping my mom make the best of her life. Perhaps I am just feeling it more today than usual. Today I checked in on a fellow blogger who somehow stumbled upon my blog a few months ago. The title of her post was "My Last Post". This week I also saw the movie "Still Alice" after reading the book years ago. It is the movie where Julianne Moore plays Alice, a woman diagnosed with Alzheimer's Disease (more on that next week). I learned another blogger friend is saying her goodbyes to her sweet mom who has Alzheimer's Disease. Add to this my awareness that another friend is coming upon the first anniversary of her mother's death. Tonight these things are weighing heavy on my heart, and although I know this is not a happy thing to be blogging about, it is a very real thing. I can't help but feel for each of them. I write this if for no other reason than to remind myself and, perhaps, some of you that each day truly is a gift!! I will continue to treasure each visit with my mom and, as always, all of my goodbyes will end with a kiss and an "I love you" -- and I even get a "love you, too" back. The day after my last post, I headed over to visit and check on my mom. Originally, she was napping in her chair in the commons area. Unfortunately, I always tend to arrive around the same time...after lunch. This means they have already had showers, breakfast, lunch, and at least one activity. So, it's not terribly surprising that it is "nap time". A couple of staff members told me my mom was actually asking where I was... That was kind of exciting, as I have not known her to do that very often. One of them told her I was probably "at home" and my mom asked what I was doing. The staff member said, "Oh, she is probably cooking dinner or something" to which my mom replied, "Oh no, she is not!!" Shoe wasn't buying it and since it was about 1 pm I can say there would be a small chance I would be cooking dinner! While she was napping, I took the opportunity to straighten things in her bedroom. She is almost never in there when I visit, but I still like to oversee her "things" and mail and try to make sure everything is in order. I took down the Christmas cards and displayed some of the other cards as I know she always likes to see her "cards". The staff is amazed how many she gets and have commented several times about her "popularity". It's sweet, but really to me it has more to do with how little mail some of the other residents may get. Alzheimer's and memory issues have a way of making friends and family in your life gradually disappear. It's always nice when the staff has the time to chat and fill me in on how my mom is doing. Not long after I pulled a chair up near my mom, Linda arrived and an activity was about to start. It was trivia time once again, so I decided to stay. It had been awhile since I hung out with everyone for trivia and I wanted to see how my mom's skills were. We joined in a bit late, and I noticed the lady in pink and the lady in navy blue on the far end were getting most of the answers. I am again reminded to never judge a book by it's cover -- as I bet may people would doubt how sharp these ladies actually are!! Questions about celebrities, inventors, historical figures, etc. I also was reminded how much my mom just loves watching Linda as she is very animated in her descriptions, hints, and impersonations when the residents need help in getting to the answers. I believe I said this before, but my mom will say the answer to me but not out loud. I am convinced (because I know my mom so well) it is partially because she does not want to interrupt Linda. To her, Linda is a one-woman show with all her singing, comedy and impersonations. My mom did okay, but those other two ladies brains were all warmed up and they were on their game. Of course, my competitiveness always comes out and I want to shout out the answers!! For whatever reason, one of the only people they could not come up with was "Cinderella". All the clues were given, but nobody came up with it. I wanted to shout out "didn't any of you watch The Bachelor last night"?? Ya know, when Jade got to have a one-on-one date and be Cinderella!!?? Ha! Don't worry, I didn't really do it! During my visit, I couldn't help but notice one of the residents, Pat, was in bed in her room. At one point when they checked on her and I noticed there was some concern and they were monitoring her vitals. Her room is across the hall from my mom's. You can tell she is a much older lady, but she is also still very sharp and usually out and about. I couldn't help but be concerned, and I heard them talk about continuing to monitor her. I had to pick up Jacob at school, so I headed out while my mom was being entertained and snapped a couple of pictures as I left. I noticed one of the head nurses was also at the nurse's station on my way out, so I took the opportunity to ask them if they were monitoring my mom's blood levels for a particular medication she takes. They said it was in their records so I did not need to remind them. That was good to know as the first time I asked about it they were not aware of it. Then, the nurse asked me about one of her medications. I told her she was on it because she has lupus. Apparently, they did not have a record of her having this condition except from my forms that I filled out. Hard to believe she has lived there six months now, and we are still sorting things out. I was told repeatedly that they did not want my mom's medical records when she moved in. I still do not understand that. Now, I am at least having her diagnostic records sent over. I remember my mom's neurologist, at my request, sent her records to this nursing community before we were even admitted. I was told to do that by several social workers as a means of trying to get our foot in the door and speed things along once we were admitted. After that, they told me not to send any more records, blah blah blah. So, I didn't want to irritate them when I was trying to get her admitted. Well, now here we are and there are pieces of my mom's health records that they obviously do not have. That said, I cannot complain much as the day to day care seems to be very good and my mom has not been harmed by the omission. Now that the staff put my mom in a bit more comfortable wheelchair, her first one is folded up. My brother is going to store it in my mom's condo basement. I also took the opportunity ask the staff about her walker. It's been in her bedroom all this time, but I was quite certain she never used it. As I suspected, the staff said she no longer uses it so we will be storing that as well. I am still not used to the wheelchair and it makes me sad to put the walker away. However, I looked back and my mom's repeated falls started happening about a year ago and we certainly don't want to go through all of that again. They have lift thing they use to transfer most of the residents which looks like this. I had actually never seen one in use until my mom moved to this nursing community. 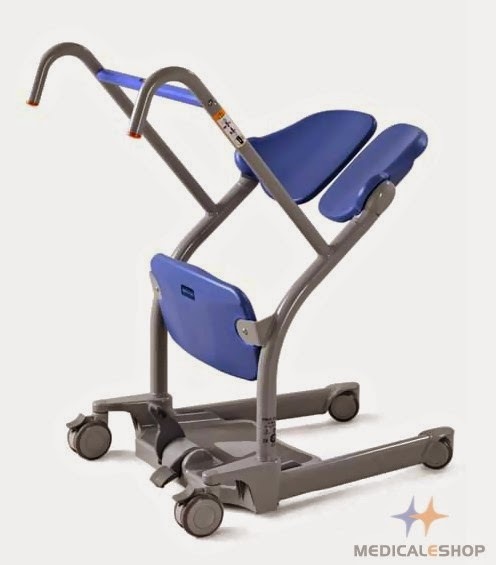 Those blue seat pads fold up and then the person grabs that blue bar until they are standing and then they either stay standing or rest on the blue seat as they are wheeled to bed or whatever. So many changes, but my mom seems as happy and healthy as can be!